To do list " old school"
What do you do when it is too hot to cook? So, as I love to share information and help out fellow gusset strugglers, I have put together a little tutorial for you! First we will start with my diagram!! Now don't laugh but I was actually pinning this triangle underneath to the bottom of the bag and wondered how on earth I was going to sew the darn gusset! duh.. I found it easier to mark out the bag like this. I decided to go with a plain colour for the lining and band and stretch Amy's lovely forest/wood fern fabric (Nigella range) as far as I could. Yes it is a fairly large bag like everyone says but I like it and took it for a road test this morning to playgroup and it was great! I am really happy with the end result and taking the time to make something for me! Next time I would use the same weight fabric all over as the band was in a slightly lighter cotton and couldn't handle the interfacing - it looks ugly close up! As many others have said, I would probably lose the stiff interfacing in the strap and outside. I like the soft padded feel of a big bag and wish my handle was softer. I did a silly thing and clipped in 3 places instead of one as per the instructions in 7C. I did it because it didn't look right to do as instructed (go figure...), so I clipped either side of the seam and close to the middle. But I found once I had finished the bag, just under the bottom seam on the band there is a little bulge that looks odd and I am sure not supposed to be there! Next time before start a project - I will do some more research!! Also, join the online sewing community for free at Sew Mama Sew and enjoy some of the great forums discussing such things as this. Thank you for posting this info - I, too, am stuck on the gussets and your pictures and description really helped. Hopefully I'll have the pictures of the finished product up in a day or two if you'd like to take a look. Very nice bag. I, too, found the instructions confusing. I breathed a sigh of relief once I turned it inside out and it looked ok. Good job. Thanks for sharing. That is beautiful! I'm making this now as my first project and I'm having some trouble but seeing yours makes me want to carry on! Thank you for your clear instructions. I was sailing along till I just couldn't conceptualize the gussets. Yours were a big help! Thanks so much! I was stuck thinking this was much more complicated. Your simple directions were so helpful! Your tutorial is amazing and totally saved my life!!! I made my BIRDIE SLING last night and almost had a complete nervous breakdown trying to figure out the gusset at 1a.m.! Thank you so much for the help w the gussets!!! I was about to shoot myself because I couldn't figure out her diagram! Thank you! I don't feel so bad now that I know everyone else found the instructions totally confusing. 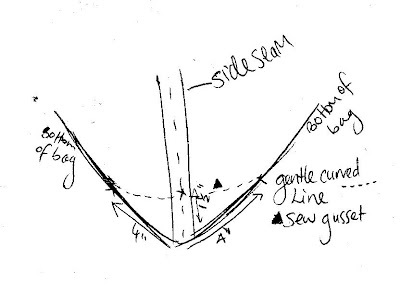 I was ready to bang my head against my sewing table trying to figure out the gusset diagram. Thank you! Thank you! You are a saint. Oh my goodness, I'm SO GLAD I just "googled" the words, "Amy Butler gusset" because I'm stuck on this step at this very moment and about to pull my hair out. THANK YOU for posting this and helping me avoid a major temper tantrum!